Banbury Bulls have hit top form in the past couple weeks but still trail Old Centralians by four points in Wadworth 6X South West One. 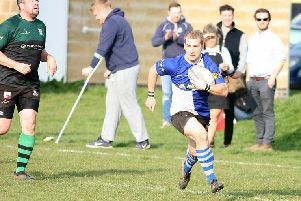 Centralians have tricky fixtures at Salisbury and Royal Wootton Bassett, so Bulls could still sneak their way into second place if results go their way. But, for now, player-coach Matt Goode is happy with the way his side is playing and it was another top drawer display against Trowbridge. He said: “I thought we were fantastic, Trowbridge are a good side, so to score 62 points against them is brilliant. “We stuck to our game plan, we played our patterns and scored some fantastic tries. I’m delighted with the team try, the boys are playing with confidence and we’ve been working hard in training. And Goode was full of praise for Tommy Gray who has adapted well to his new position in recent games.